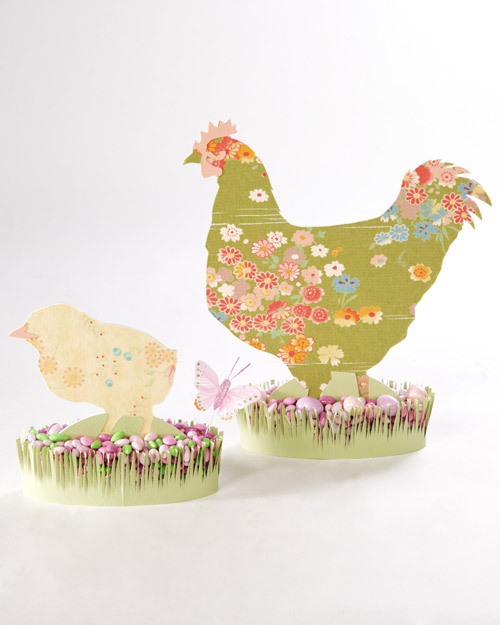 Martha shows you how to craft charming fabric silhouettes for Easter. Fabric Silhouettes How-To 1. Cut mat board to 8 by 11 inches. Cover white side of mat board with Double Tack adhesive: Peel one corner of backing, attach to corner of mat board, and remove remainder of backing while smoothing onto mat board. 2. Print bunny, bunny with cane, chicks 1 and chicks 2, or chicken template. Affix the template to the mat board with regular tape. Cut out the base, stands, and silhouette pieces. 3. Peel backing off other side of Double Tack, and apply fabric to the silhouette, using a bone folder to smooth. Turn silhouette over, so mat board side is facing up, and cut off excess fabric with a sharp knife. 4. Affix Double Tack to decorative paper and cut out the shapes within the silhouette, represented by dotted lines. Peel off backing and apply the shapes to the fabric-covered silhouette. 5. Affix silhouette to the base and stands using craft glue. 6. To make the “grass,” cut a piece of green paper an inch and a half wide by 11 inches long. Use shredding scissors to cut grass along the length of the strip. 7. Wrap grass around base of silhouette, and affix with double-sided tape. Fill base with candies, and embellish as desired. Resources Double Tack mounting adhesive is available from crafts stores and misterart.com. Shredding scissors are from compact-impact.com. All other tools and materials are available at crafts and fabric-supply stores.